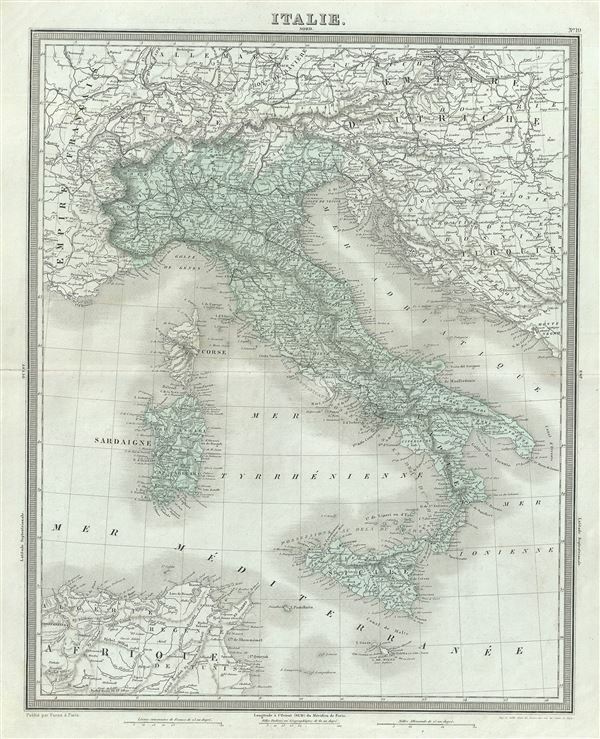 This is a beautiful 1874 map of Italy by Ambroise Tardieu. It depicts the Italian peninsula in the midst of its struggle for national solidarity. Includes the Kingdom of Sardinia, Corsica, and Sicily. Throughout, the map identifies various cities, towns, rivers and an assortment of additional topographical details. The islands of Sardinia and Corsica are included. In 1861, Giuseppe Garibaldi and his Red Shirts led the drive for Italian national solidarity. On March 17, 1861, the Sardinian government led by the Count of Cavour finally declared a unified Kingdom of Italy. Even so, Italy would not be fully united until the Franco-Prussia War forced France to abandon its support of the Papal States in 1870. This map was prepared by Ambroise Tardieu and issued as plate 19 in his 1874 edition of Atlas Universel de Geographie Ancienne et Moderne.